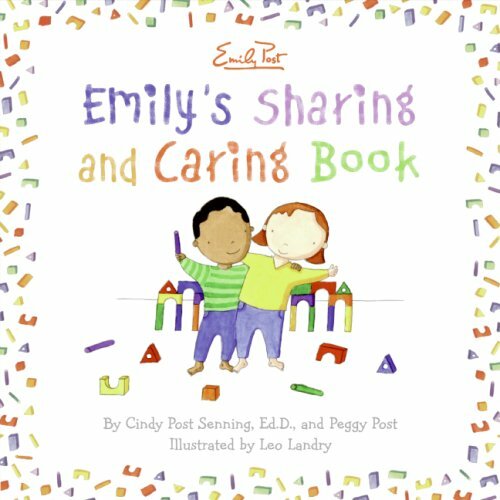 Emily’s Sharing and Caring Book, by Cindy Post Senning and Peggy Post, conveys the message that sharing IS a way of caring, and could be especially helpful if you have a toddler or preschooler having trouble with that concept. Could you relate your feelings without this book? Sure, but this book offers extra help bringing the message home, and in a gentle way. I wouldn’t make the case for this title if it were one of those issue books posing as a fun storybook. But it is clearly categorized as a nonfiction book in manners, having been written by co-directors of the Emily Post Institute. You know, the etiquette people. Having a niece with some sharing... challenges, I thought the concept was handled well. In the book, sharing is shown as a special way that the character makes others smile, which puts the focus on the reward instead of on the moral argument. That sharing gets a smile  rather than that sharing is the Right Thing To Do  seems more appropriate for a toddler or young preschooler’s stage of moral development. The illustrations by Leo Landry bring warmth to the story, as a little girl interacts with several people including a grandma, a dad, a mom and peers  brothers or friends. I also like the inclusion of a child of color on the cover. Ahh, we are having a bit of trouble sharing with our little sister around here. Thanks for the recommendation. Ooo. A not preachy way of showing how sharing is rewarding? Sounds great!